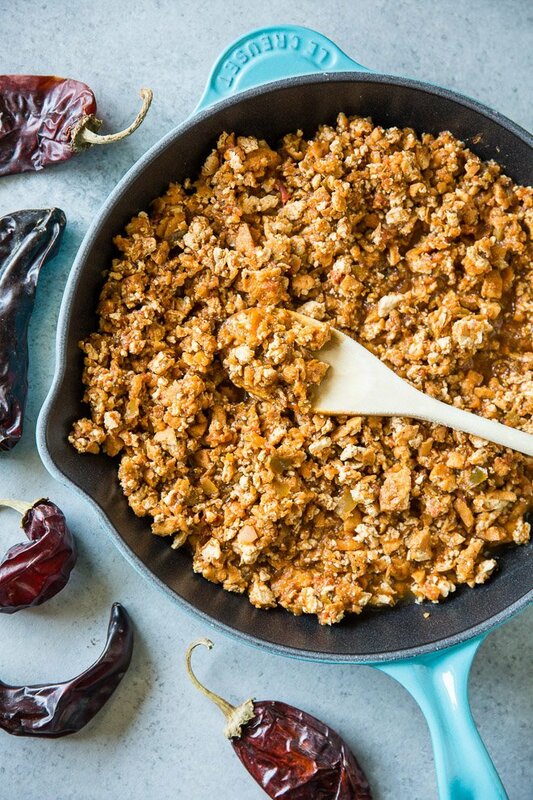 This Chipotle Sofritas recipe tastes just like the original! Shredded tofu braised in spices makes a great vegan option for burritos, tacos, and salads. To all my meat-eating friends: This recipe tastes better than you think it does. I’ve seen it a million times. Okay, about 40 times. But still! DATA DOESN’T LIE. 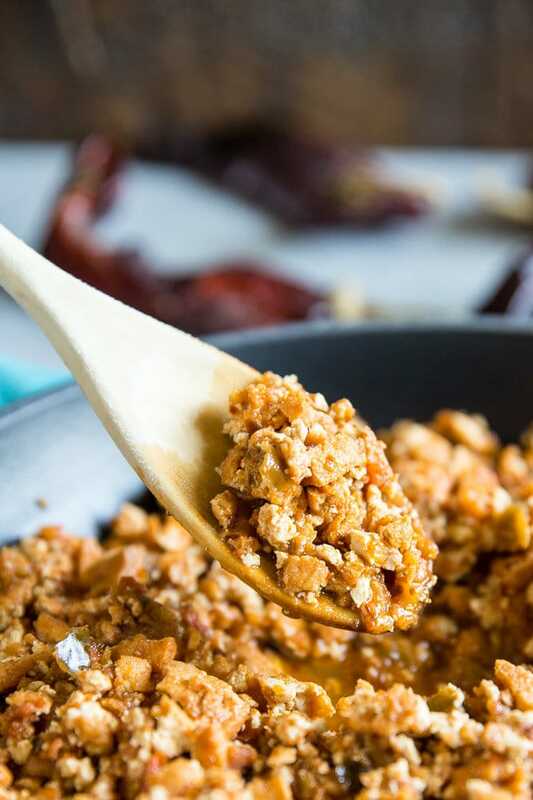 One reason I am posting Chipotle Sofritas is because I have a Type-A personality and want to finish the project I started: Sharing all Chipotle copycat recipes. A second reason is because vegan Chipotle Sofritas is delicious whether you’re a vegan or not. Start with extra-firm tofu and squeeze it to extract as much liquid as possible. There are two easy ways. Wrap in paper towels and place in a dish. Set a heavy dish on top such as a large can, a brick, or your oversized cat. Use a handy-dandy super-slick fast-and-easy tofu press. Once you’ve pressed the tofu, slice it into 8 slices. If you your brick is really divided into 2 bricks, cut each slab into 4 slices. You’ll know what I mean once you start looking at tofu. While pressing the tofu, make the easy Sofritas marinade. It’s a combination of fresh tomatoes, peppers, and onions, some chiles, and lots of spices. 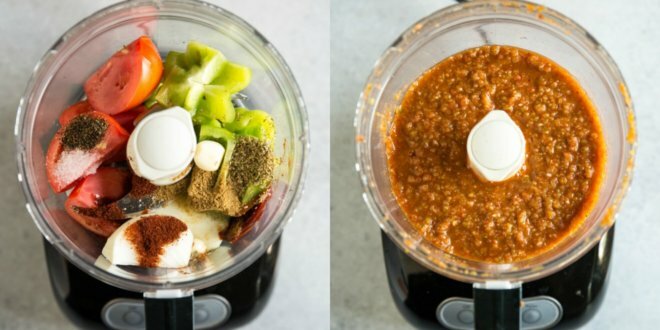 Throw everything in a food processor or blender and hit BLAST. Marinade = done. 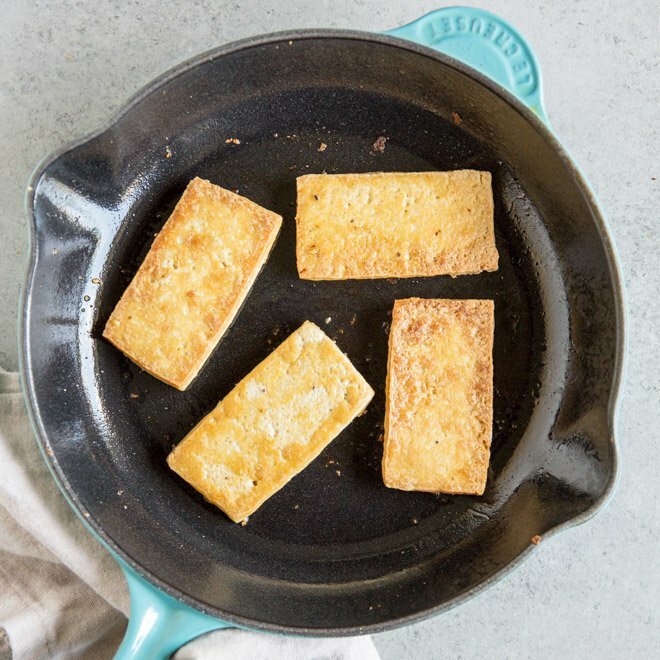 Brown the tofu in a pan to give it texture and flavor. SO GOOD. When I snack on it, it reminds me of griddle cakes (but that’s probably just me). Depending on the size of your pan, it’s okay to brown your tofu in batches. Use enough oil to cover all the areas where the tofu is going to touch. But don’t worry if it feels like it’s sticking! Just leave it in the pan and when it’s ready, it will release. If you try to flip it too early, it might stick. Pulse the browned tofu in your food processor or blender until coarse crumbs form. Try not to pulverize it. Those big pieces add a nice texture to the final dish. Speaking of the final dish, all that’s left to do is combine the shredded tofu with the marinade. Toss it together in a large pan and simmer it on the stove until heated through. If you like more liquid in the pan, add more water. Make Chipotle Sofritas tacos, burritos, salads, bowls, and quesadillas. Meatless Monday will never be the same! 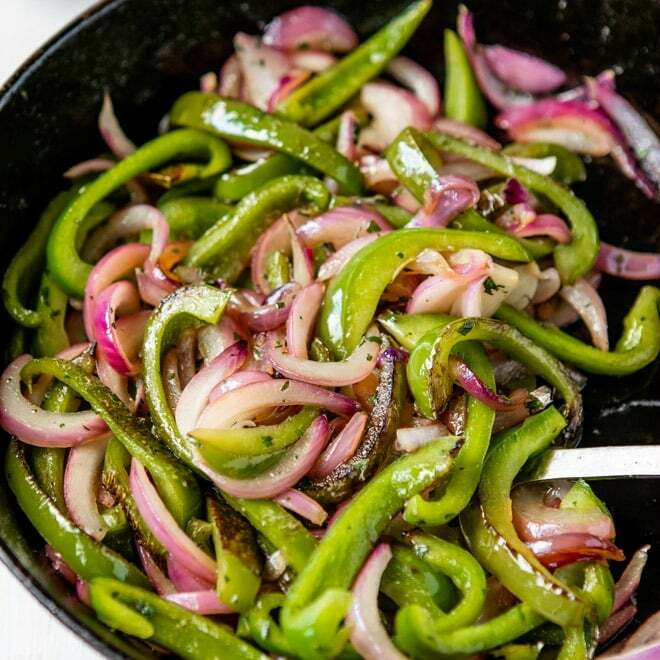 In a skillet over medium-high heat, bring oil to a shimmer. Cooking in batches, carefully place the tofu in the pan, flip occasionally, and cook until the tofu is golden brown, about 10 minutes. Remove from pan and drain on a plate lined with paper towels. Meanwhile, for the marinade, in a food processor, combine the tomato, yellow onion, garlic, green bell pepper, cumin, ancho chili powder, chipotle chilies, adobo sauce, dried italian oregano, red wine vinegar, salt, pepper, and the water. Pulse until the marinade is slightly chunky and thoroughly combined. Set aside. Roughly chop the tofu, or pulse the tofu in a food processor until the tofu is roughly in 1/4 inch pieces. Place in a bowl and add the marinade. Cover and allow to sit for at least 30 minutes, or overnight in the refrigerator. Once marinated, heat a medium skillet over medium high heat. Add the marinated tofu and any remaining marinade. Add 1/4 cup water and bring to a boil. Add additional water to desired consistency. (I like there to be additional liquid for serving.) Reduce to simmering. Cook until the tofu throughout heated, about 10 minutes. Serve. 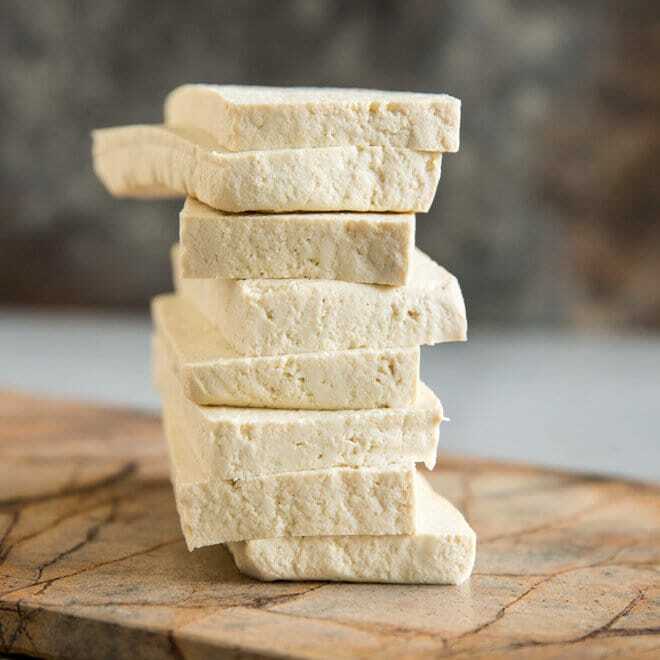 To press the tofu: drain the tofu and wrap in paper towels and place in a dish. Place a heavy object, such as a can, on the tofu for about 15 minutes, to remove moisture. Or, use this easy tofu press. To obtain adobo sauce and chipotle chilies: strain adobo sauce into a small bowl, pressing down on the peppers to extract as much liquid as possible (you should have at least ¼ cup). Reserve remaining chipotle chilies and sauce for another use. Made this recipe today along with a few other of the Chipotle copycat recipes on Culinary Hill. Always so good! Thank you so much Bridgette, I really appreciate you! I plan on trying this ASAP! I’m attempting to start meatless Monday’s. What could i substitute to make this dish with less sodium? Delicious! I made this along with the lime rice, veggies and pinto beans! Trying to cut down on the meat at my household and this definitely hit the spot. By any chance how long will this keep? It’s just two of us and will like to keep it as long as possible. I made this a week ago and am obsessed! I am going to make this again tonight but am wondering if you have tried freezing it? Hey! I’m hoping to use this in some breakfast taquitos that I can freeze. Is this freezable? Amazing recipe! I loved this marinade. Thanks you so much for sharing!